Summary: Large military forces give us a greater range of options — but they also narrow our options. The existence of arms creates pressure to use them. Our ability to intervene creates a feeling of responsibility. Deaths following our failure to intervene become our fault (see Lang’s comments below). Yet military strength provides neither the wisdom or the local knowledge to use it — both scarce in the US, as our post-WWII history of intervention shows. This post examines both sides of the debate, with some messages from Libya and historical reminders. The comments have excerpts and links to new articles of interest about Libya. Our geopolitical leaders feel strong sympathy for the people of Libya. All those Moslems sitting on a sea of oil — they must need our help to overthrow Gaddafi and establish a new regime. A no-fly zone is the first chip in the game. Probably followed by Special Forces to provide arms and training (plus money and personal assistance to those leaders that best fit our needs). Otherwise they might choose inappropriate leaders. Here are a few of the many calls to move our forces into position. Then the hawks will pick an occasion to press for intervention. As always, no mention of costs or risks (real hegemons never ask such questions, until they go broke). Perhaps it will be easy, quickly ended, and cheap. Our experience in Vietnam, Afghanistan and Iraq remind us of the uncertainties of war. This is a real moment of choice for the international community. Believe me, what we are hearing is the Arab world is watching. Will the future be the peaceful democratic revolution that’s occurred in Egypt leading to democracy or will the world stand by and allow a leader like Gadhafi to slaughter his people? I’m glad there are sanctions being applied and some pressure morally at least and some economic put on Gadhafi, but honestly I think the world has to do more. I begin with the imposition of a no-fly zone so that Gadhafi can’t be attacking his own people from the air or flying in more mercenaries. I think we ought to recognize the opposition provisional government as the legitimate government of Libya and we that ought to give that government certainly humanitarian assistance and military arms, not to go in on the ground ourselves but to give them the wherewithal to fight on behalf of the people of Libya against a really cruel dictator. … The fact is now is the time for action, not just statements. The sanctions that were adopted but unilaterally by the United States and now by the U.S. really have some effect on the people in the top positions in the Libyan government and hopefully it will lead them to think twice. But the kinds of tangible support, no-fly zone, recognition of the revolutionary government, the citizens government and support for them with both humanitarian assistance and I would provide them with arms. — FM note: I suspect CIA agents with bags of cash has as much or more impact than the SF in Afghanistan. In Horse Soldiers: The Extraordinary Story of a Band of US Soldiers Who Rode to Victory in Afghanistan Doug Stanton alludes to the CIA buying support for the Northern Alliance (pages 37 and 57), but discusses neither the full scope of the project nor its relative contribution to overthrowing the Taliban. Ditto for the other accounts I’ve read. Today the United States and our allies in Europe must take action in response to the unfolding crisis in Libya. With violence spiraling to new heights, and with the apparent willingness of the Qaddafi regime to use all weapons at its disposal against the Libyan people, we may be on the threshold of a moral and humanitarian catastrophe. Inaction, or slow and inadequate measures, may not only fail to stop the slaughter in Libya but will cast doubt on the commitment of the United States and Europe to basic principles of human rights and freedoms. SECEF GATES: Well, first of all, I have directed several Navy ships to the Mediterranean. The USS Kearsarge and the [USS] Ponce will be entering the Mediterranean shortly and will provide us a capability for both emergency evacuations and also for humanitarian relief. About 1,400 Marines from the Kearsarge are serving in Afghanistan. And so we are sending about 400 Marines from the U.S. that will be in support of the Kearsarge’s mission. So those are the actions that we have taken at this point. We’re obviously looking at a lot of options and contingencies. No decisions have been made on any other actions. I would note that the U.N. Security Council resolution provides no authorization for the use of armed force. There is no unanimity within NATO for the use of armed force. And the kinds of options that have been talked about in the press and elsewhere also have their own consequences and second- and third-order effects. So they need to be considered very carefully. … First of all, all of the options beyond the humanitarian assistance and evacuation are complex. And you know, the second and third-order consequences derive from the fact that they are complex. For example, if we move additional assets, what are the consequences of that for Afghanistan, for the Persian Gulf? And what other allies are prepared to work with us in some of these things? I think those are some of the effects that we have to think about. ADMIRAL MULLEN: And with respect to the no-fly zone specifically, it’s an extraordinarily complex operation to set up. It has been done historically. We did it in Iraq for many years, north and south. And certainly if we were to set it up, if that were something that was decided to do, we’d have to work our way through doing it in a safe manner and certainly not put ourselves in jeopardy in doing that. The slowly emerging rebel leadership of Libya speaks. But will we listen? … a prominent human rights lawyer, Abdel-Hafidh Ghoga, held a news conference in Benghazi … he said politicians in the east were establishing a transitional council to manage daily life in the rebel-controlled areas until Gadhafi falls … the Libyan National Transitional Council. But the council has not yet been formed and he did not announce any of the members, except for himself as the spokesman. Ghoga was imprisoned just before Libya’s revolt began on Feb. 15. Per a Rasmussen poll on 21-22 February 2011, for all the news media’s saturation coverage of the war hawks’ views, the public remains skeptical. We learn slowly, but we do learn. #2 — Generally speaking, will a change in the government of any of these Arab countries be good for the United States, bad for the United States or will it have no impact on the United States? 26%– are not sure what to expect. #3 — Should the United States get more directly involved in the political situation in these Arab countries or leave the situation alone? 17% — are not sure. By the time the dust settles, what emerges in the Gulf monarchies is likely to be regimes far friendlier to Iran, if not in fact wholly owned Iranian subsidiaries. What emerges in Egypt is likely to be a regime far more hostile to Israel. There are different local factors in play from the Mahgreb to the Shatt al-Arab, but if you want a shorthand for the region as a whole, think of it this way: It’s the dawn of the post-western Middle East. There are two phases to recent Arab history. The modern Middle East was an Anglo-French concoction, cooked up by London and Paris somewhat haphazardly after the collapse of the Ottoman Empire. In the waning of British and French imperial power after World War Two, Washington and Moscow stepped into the breach, in many cases replacing sputtering monarchies with strongmen of a secular pan-Arab nationalist bent. Likewise, say what you like about Colonel Gaddafi but a guy who hires as bodyguards his own personal detachment of Austin Powers fembots is unlikely to be hung up on the small print of this or that hadith. The trajectory we’re now on has less to do with “social media” than with Monday’s fatwa by Imam Qaradawi, Egypt’s Khomeini wannabe, calling for the assassination of Gaddafi. The eminent scholar dismisses the Gaddafi clan as “swords of pre-Islamic ignorance” – which shows you how he regards what’s underway: The anciens régimes were “pre-Islamic”, which means that what follows will be … more Islamic. … The Egyptian royal house (descended from Albanians) was nobody’s idea of a punctilious constitutional monarchy, and Jews there had a rough couple of years in the 1940s. But the Kingdom of Egypt was a better deal than anything that followed. The CIA thought so little of Farouk that their plan to depose him was codenamed “Operation Fat Fucker”. Ha-ha. The fuckers they replaced him with had the last laugh. Nasser rounded up Jews for “Zionist activities”, removed them from Parliament, confiscated their businesses, and closed down their newspapers. The Middle East got worse. The Anglo-French-installed monarchies of the mid-20th century were less bad than the Russo-American-backed dictators of the late 20th century. As for the early 21st, the new Middle East will be friendlier to the Muslim Brotherhood and friendlier to Iran – and less friendly to western interests than at any time since the discovery of oil. When the helicopter touched down outside Benghazi in the early hours of Friday morning, the SAS troops on board knew they were entering a volatile situation. Tasked with escorting a diplomat to meet rebel Libyan forces and assessing the humanitarian situation on the ground, they did not, however, expect a hostile reception. With the British Government openly rejecting Colonel Muammar Gaddafi and already in dialogue with opposition leaders, it should have been an uncontroversial visit. However, the manner of their arrival – in the dead of night, armed with weapons, maps and explosives while dressed in plain black clothing – did little to assuage local panic. They tried to bluff their way out of the increasingly tense situation, claiming they were unarmed, which was only made worse when their weapons were discovered. Realising their cover had been blown and their supposedly discreet mission had been compromised, the soldiers put up no resistance as they were arrested. Handcuffed and taken to a military base in Benghazi, they were well treated and allowed contact with British diplomats in the troubled country. * Mr Jalil’s spokesman told the ambassador the British had made a major error in the manner of their arrival. “They made a big mistake coming with a helicopter in an open area,” he said. * Another rebel source said: “If this is an official delegation, why come with helicopters? Why not say ‘we are coming, permission to land at the airport?’ There are rules for these things. By Sunday afternoon, a crisis had been averted as the soldiers were released and their weapons confiscated. There’s no other accurate description for this foaming-at-the-mouth editorial in today’s Wall Street Journal: “Obama’s Libyan Abdication“. William Randolph Hearst would have been proud to write this. Will the U.S. let Gadhafi slaughter his way back to power? Will the U.S. let Gadhafi slaughter his way back to power? The battle for Libya has reached a bloody impasse. Moammar Gadhafi continues to hold Tripoli, but his sons and mercenaries have been unable to break the uprising or retake the country’s east. Having loudly declared that Gadhafi “needs to step down from power and leave,” President Obama now seems to have retreated into a bizarre but all too typical passivity. Pelman is a senior consultant with the International Crisis Group. He is the author of A New Muslim Order: The Shia and the Middle East Sectarian Crisis. (November 2009). The implication is that the enforcement of “no-fly zones,” by the U.S. alone or with NATO allies, would be a moderate, reasonable measure short of war, like a trade embargo. In reality, declaring and enforcing a no-fly zone in Libya would be a radical act of war. It would require the U.S. not only to shoot down Libyan military aircraft but also to bomb Libya in order to destroy anti-aircraft defenses. Under any legal theory, bombing a foreign government’s territory and blasting its air force out of the sky is war. Could America’s war in Libya remain limited? The hawks glibly promise that the U.S. could limit its participation in the Libyan civil war to airstrikes, leaving the fighting to Libyan rebels. These assurances by the hawks are ominously familiar. Remember the phrase “lift-and-strike”? During the wars of the Yugoslav succession in the 1990s, Washington’s armchair generals claimed that Serbia could easily be defeated if the U.S. lifted the arms embargo on Serbia’s enemies and engaged in a few antiseptic airstrikes. Instead, the ultimate result was a full-scale war by NATO. Serbia capitulated only when it was faced with the possibility of a ground invasion by NATO troops. Undeterred by the failure of lift-and-strike in the Balkans, neoconservatives proposed the same discredited strategy as a way to remove Saddam Hussein from power in Iraq. Paul Wolfowitz and others proposed the creation of enclaves in Iraq, from which anti-Saddam forces under the protection of U.S. airpower could topple the tyrant. Critics who knew something about the military dismissed this as the “Bay of Goats” strategy, comparing it to the Kennedy administration’s failed “Bay of Pigs” operation that was intended to overthrow Fidel Castro without direct U.S. military involvement by landing American-armed Cuban exiles in Cuba. In Iraq, as in the Balkans, the ultimate result was an all-out U.S. invasion followed by an occupation. In Afghanistan, Afghan rebels played a key role in deposing the Taliban regime. But contrary to the promises of the Bush administration that the Afghan War would be short and decisive, the objective was redefined from removing the Taliban to “nation-building” and the conflict was then thoroughly Americanized. The result is today’s seemingly endless, expensive Afghan quagmire. The lesson of these three wars is that the rhetoric of lift-and-strike is a gateway drug that leads to all-out American military invasion and occupation. Once the U.S. has committed itself to using limited military force to depose a foreign regime, the pressure to “stay the course” becomes irresistible. If lift-and-strike were to fail in Libya, the same neocon hawks who promised that it would succeed would not apologize for their mistake. Instead, they would up the ante. They would call for escalating American involvement further, because America’s prestige would now be on the line. They would denounce any alternative as a cowardly policy of “cut and run.” And as soon as any American soldiers died in Libya, the hawks would claim that we would be betraying their memory, unless we conquered Libya and occupied it for years or decades until it became a functioning, pro-American democracy. The rebel movement in eastern Libya said on Wednesday it did not see any issue in obtaining more arms as needed and said it had been promised help from Qatar and other countries. “Our military committee is assessing what we need. A no-fly zone will be great, but our troops will also be facing tanks. We will see whether we need to make (arms) purchases. I do not see getting arms as an issue. Qatar and many other countries have offered to help,” said Mustafa Gheriani, media officer for the rebel National Libyan Council in the eastern city of Benghazi. (2) “Libyan rebels call for support from US, allies“, USA Today, 9 March 2011 — Very carefully edited quotes, vagueness shaped to influence public opinion. What kind of aid do the rebels want? Food, ammo, air cover, troops? Do the rebels have an organization, with leaders authorized to ask for help? Would their rule be better for America than the current regime? Better for the Libyan people (yes, a new regime could be worse)? But although intervening on behalf of regime change in Libya has grabbed the attention of the commentariat, no such calls are heard for America to defend democracy just a bit further to the south and west, in the Ivory Coast, where a democratically elected president, Alassane Ouattara, has been unable to compel his predecessor, Laurent Gbagbo, to transfer power. Gbagbo’s militias are using no less violent methods to hold on to power, but because the dramatic images have yet to saturate our television screens, pundits have not seen fit to gravely warn how Obama’s “failure” to act jeopardizes U.S. global leadership. 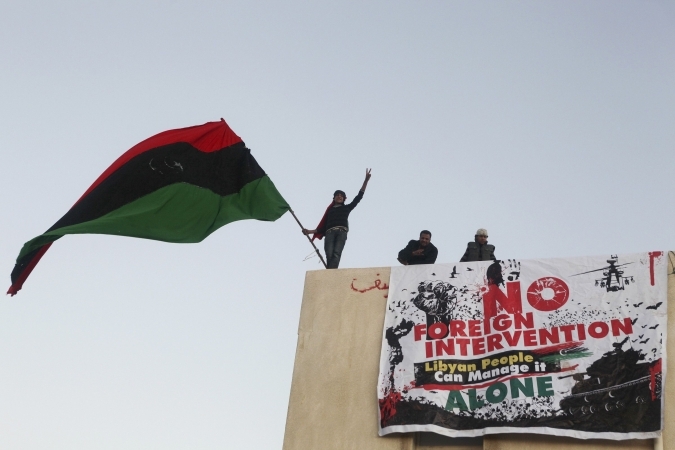 There is a case to be made for U.S. intervention in Libya. My problem, however, is with the knee-jerk reaction of the foreign policy establishment to proclaim every new televised crisis as the “test” of whether America remains a global leader or whether the president, by not immediately dispatching U.S. military forces, is abdicating his responsibilities to defend U.S. interests and the U.S.-led international order. Indeed, stepping back to observe the big picture over the past six months, what is striking is the utter and complete incoherence of expert commentary on what America’s interests are and what role the U.S. should be playing in the world. … And what of the anti-Gadhafi opposition? Sen. Jim Webb sounded a cautionary note this past week, saying, “It is not a good idea to give weapons and military support to people who you do not know. When it comes to the opposition in Libya, we do not know them.” Right now, the National Transitional Council based in Benghazi is characterized as pro-democratic and pro-Western, with some asserting that if it comes to power in Libya, it would turn the country into a firm ally of the West. But is that assessment based on hard intelligence or media speculation? During the uprising that deposed former President Hosni Mubarak in Egypt, the protesters in Tahrir Square were hailed as the forefront of a new democratic movement. Will the same talking heads who last month castigated the administration for being too slow to “support freedom” in Egypt be the first ones to denounce Obama for “losing” that country if elections bring to power an illiberal democracy that ends up being much less pro-American? Foreign policy is not a video game where a player can rely on an endless supply of resources and where there are no consequences for failure. Any military intervention should have clear-cut objectives and be undertaken with no illusions about the costs and risks. George Will raised a set of questions to this end in his column this week. We should formulate clear answers to them before making any commitment — in Libya or elsewhere. The president does have the constitutional power to repel attacks on the homeland, but nobody suggests that Gaddafi’s assault on his domestic enemies is a threat to the United States. An attack on Libya’s air defenses would be a war of choice, not self-defense. No existing statute or treaty allows this action. Gaddafi isn’t linked to Al Qaeda, so an attack against him isn’t supported by the resolution authorizing force against terrorists involved in 9/11. If Obama goes it alone, he must return to Bush-era assertions that the president, as commander-in-chief, can unilaterally launch the nation into war. … I’ve thought about military interventions for a long time – from before my service in Vietnam to writing a master’s thesis at Fort Leavenworth to leading NATO forces in the Kosovo war. In considering Libya, I find myself returning to the guidelines for intervention laid out by Defense Secretary Caspar Weinberger in 1984. The world has changed a great deal since then, so I’ve adapted and updated his vision to develop my own rules for when the United States should deploy its blood and treasure in operations far from home. Clark was NATO supreme allied commander in Europe. Now a senior fellow at the Burkle Center for International Relations at the University of California at Los Angeles. Richard Downie is the deputy director of the Africa program at the Center for Strategic and International Studies.